At Eye Care Associates, we offer comprehensive vision exams in Houston, TX, that cover all aspects of your sight & eye health. We know that your family’s health is important, but it’s hard to find the time; so we do our best to find eye appointments that will accommodate your family’s busy lifestyles. We start with questions regarding your daily life and any symptoms you may be experiencing at home or at work. We also take record of your vision, medications, and overall health. Then our optometrists perform a visual exam to take a look at your eye and eyelids. This is done with magnification and light and may require dilating of the pupils. We also record your eye pressure with tonometry, which is an important test to identify patients at risk of developing glaucoma. 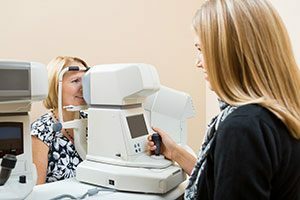 After these tests, we review the results and discuss treatment options or corrective lens choices. Please contact us at (713) 621-9001 to schedule an eye exam today.